Are you getting on board with marketing automation? If so, you need a marketing automation strategy. Investing in automation is a smart move for your business. It can save as much as 12.5% in sales costs and increase sales revenue by 14.5%. That’s a big return on investment for your business. While the potential is there, a good marketing automation campaign needs careful planning and strategy behind it. If you put emails together and send them out randomly, your results probably will probably show it. Are you ready to learn how you can create an automation strategy for your business? Keep reading for 5 tips to help you create a marketing automation strategy that generates leads and sales. Yes, marketing automation is a great tool to have in your toolbox, but, it’s not and shouldn’t be the only tool you use. You still have to market your business and you still have to sell your product. It can work great with a digital marketing strategy like content marketing or SEO. Those strategies work to bring potential clients to your website. Marketing automation fits in by helping build trust and developing a relationship with your prospects. That makes it easier for them to buy from you. It helps you stay in front of your customers and clients at crucial times during the buying process. If someone was on your author site and they started to create an order, you can automate an email follow up with them. That will remind them that they almost placed an order and they can complete it. Once you understand the power of digital marketing automation, you can create a strategy that is built for your business and for your customers. The first thing to do when creating a marketing automation strategy is to think about your prospects. Not just think about them, but get to know and understand them. Consider how they get to your website and what they’re looking for. You’ll also want to complete a buyer persona for your customers. It’s rare to only have one buyer persona, so you’ll have to do this exercise a few times for each type of buyer you have. Writing a buyer persona is like creating a character for a book. Except, in this case, you’re creating your ideal customer. Some of the things that you want to include in your buyer persona are demographic information (age, gender, marital status, location, occupation) and psychographic information. These are questions that can help you uncover psychographic information. What are they trying to fix or accomplish by using your products or services? When they make a purchase, what do they value? Do they value price more than customer service? Would they be willing to pay more for better service? Where do they turn to get information? What would they object to before saying yes to you? Once you have these in place, then you can focus on the journey they take to make a purchase. Each customer takes some kind of journey before they commit to becoming a client of yours. A typical journey is that they become aware of your product. That can happen through social media, an online review, or a referral. They’ll then become interested in your business offerings. They’ll continue to look around until they have a need for your services. At that point, they’ll take action. When you’re setting up marketing automation strategies, you need to map out your customer’s journey from becoming aware of your business to become a client. ➋ What Are the Best Opportunities to Automate? When you have your customer’s journey mapped out, you can then point out critical points where the prospects can be engaged. Your goal is to lead the customer through the buyer’s journey faster with marketing automation. You could have a prospect visit your site and sign up for a free download. You can then automate several follow up emails to engage them and get them to take the next step. Consider how you can support the sales process and your customer service team, too. Creating your strategy will require that you set some goals for your business. When you see what the opportunities are for your business, you can set goals for each one. You might have seen low hanging fruit like providing more educational information before your sales team gets on the phone with a prospect. You can then measure the results for closing rates to see if the educational information helped a prospect make a decision. At the center of your strategy is the marketing automation tool you’ll use to implement your strategy. There are certain features you’ll want to have in your platform. Social media integration, landing pages, email forms, and integration with your CRM are just a few features to consider. You’ll also want to have detailed analytics so you can tell what’s working and what’s not working. A good marketing automation strategy is built on data. You’ll want to periodically review your analytics to determine if your messages are being opened and if leads are engaging with your content. Analyzing data also presents an opportunity to A/B test your messages. You could find that one headline performs better in your tests or a particular message resonates better with one of your buyer personas. That’s one reason why it’s so important to choose an automation tool with good analytics and testing capabilities. You’ll be able to enhance your strategies and improve your results. It’s no secret that marketing automation can make a huge difference in your business. It can generate more revenue while decreasing your sales costs at the same time. That can turn into a massive advantage to your business if you do it right. Your job is to develop a strategy that is aligned with your client’s journey to buy and use the best tools that match your customers and your strategy. 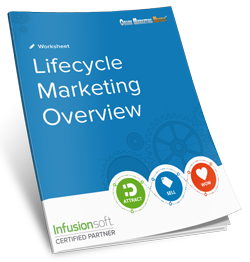 Would you like to know how you can create a marketing automation strategy for your business? Thank you for sharing the article on Marketing Automation. I own a small startup, hence I found the blog very interesting as I got to know the 5 beneficial tips for crafting your marketing automation strategy. I used Aritic PinPoint for my business and found it beneficial for my business as it has a number of features like segementation based on different factors, automated drip campaigns and a lot more. Excellent Jenna. Glad you enjoyed the post and are leveraging marketing automation in your small business!